Are you bored of listening same sound when computer starts? You can make computer play different sound audio each time Windows start. StartSoundRandomizer is a free application that makes this possible real easy. It allows Windows computer to play either of pre-selected audio file at the startup. 1. Download StartSound Randomizer [weblink] free program. 2. Double click to unzip the downloaded file (no install required). 3. Right click on app icon & then Send To > Create Desktop Shortcut. 4. Goto Start > Programs > Startup (right click on Startup, click Open). 5. Copy StartSound Randomizer shortcut in the startup folder. 6. 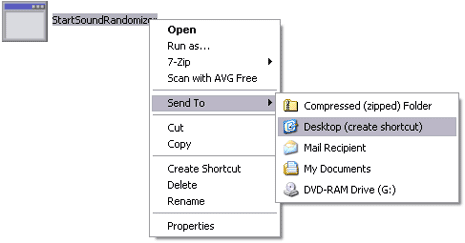 Double click StartSound Randomizer icon and select folder containing wav audio files that should be used to play random sound audio at Windows startup. Above steps should setup your Windows computer to play random audio sound each time PC starts, like it? How to migrate & transfer files, settings in XP to Window 7 upgrade?